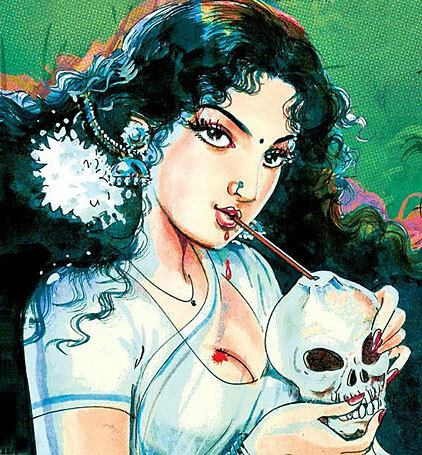 This Halloween I’d like a copy of The Blaft Anthology of Tamil Pulp Fiction Vol. II, edited by Rakesh Khanna, and translated by Pritham K Chakravarthy. The cover was drawn by Shyam Shankar, and is also available to purchase as a poster, on the publisher’s website. The company’s based in India, so I’m not sure about postage and packing, but it seems ridiculously cheap, if my currency converter is to be believed! My own scripts are veering towards a sort of pulpy “Indian Gothic” vibe at the moment, and just yesterday I picked up a book about Indian myths and legends (cunningly titled Indian Myths and Legends), which I’ll work my way through at some point… but this sounds much more fun. Personally, I prefer to lather my work with “social messages”… but then, I am writing satirical comedies, rather than straight genre stories, so hopefully that won’t put people off too much…? This entry was posted in Rants about Art, Rants about Books and tagged The Blaft Anthology of Tamil Pulp Fiction Vol. II. Bookmark the permalink. Oh my—that sounds like a hella fun read! Let’s just hope the Pumpkin King reads my letter… and doesn’t cut a big hole in the pages of the book, to hide a scary bat inside… or something tricky like that. Treats only, please and thank you!